Inside the sanctuary, guests will get to be introduced to the largest mammal on planet earth and if the water level in the river permits, you can also bathe in the river with these marvelous creatures. Bathing of elephants is a unique experience that every visitor in the Elephant Sanctuary should not miss. The idea for the elephant sanctuary was an initiative by Malaysia’s Wildlife Department which doubled as an elephant relocation site because they have been severely affected by the encroachment operations of large plantations. 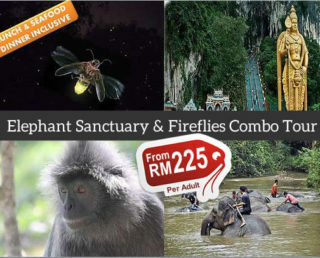 A part of this package is a visit to the Batu Caves which will be a short stop over before proceeding to the sanctuary. Upon arriving at the sanctuary, all visitors are required to watch a short video presentation containing information on the conservation efforts inside the sanctuary. After the video, guests will then proceed to the elephant adventure experience. Our guests are advised to bring with them sunglasses, outdoor shoes, long pants, T-shirts and a sun hat. For tourists who plan to try the elephant bathing activity bringing another set of dry clothes is recommended. 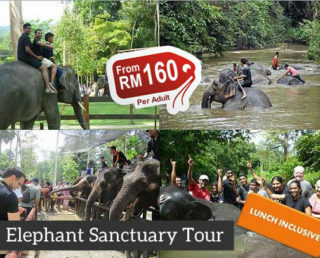 Watch this video to find out more about Elephant Sanctuary at Kuala Gandah.